The pizzaburger thread brought back the memory of concession infrared heated sandwiches before microwaves became popular. We tried to have a discussion about this many years ago but it was hijacked by discussions about early microwaves. These all used a special, dual light source, infrared oven that cooked prepared, flash frozen sandwiches packed in a translucent, sealed celophane bag. They could handle many sandwiches at a time. The result wasn't bad at all and vastly better then microwave preparation. The sandwiches came out toasted on the ends, the meat hot, and the bag only suffered a little browning. Many vendors that did batches of sandwiches held them under infrared lighting for immediate sale. Unfortunately, those that weren't sold usually found their way back into the freezer and were reheated again and someone often wound up with a dried out sandwich the next day. How many of you remember these? The original company that sold nationwide franchises was Stewart. I believe a relative of one of the original group that started the company was/is a member of this board. Down here, they seemed to had some sort of problem by the early 70's as most places that sold the Stewart brands changed over to another vendor named Landshire that sold an exact & identical frozen product offering almost overnight. Landshire is still around as a pre-packaged sandwich vendor. I've seen others on the net over the years such as Jimbo's Sandwiches, McKim, & Chef Wiz that used the same formula. I'm sure there were others. They could be found anywhere in convenience stores, snack bars, gas stations, school lunch programs, bars, just about anywhere where HD prohibitions would have made on-site preparation too much of an investment or burden. All these places would furnish the oven and promotional material for free if you subscribed to a scheduled, minimum delivery of their products. Some also delivered a private labeled brand of chips, pretzels, cookies,popcorn, and snacks similar to Lance,Tom's,Lay's or other similar vending products including racks/shelving to create a entire snack bar/lunchroom experience with no more investment then refrigerated storage and somwhere to put the ovens and lights on. Those of you that remember these, did you have a favorite sandwich? Some of them had a cult following of folks that bemoan their demise to microwaved products. Do you remember any of the names or ingredients? Hamburger/Cheeseburger/Pizza burger (these were made with what I think was a soy extended beef patty complete with fake grill marking) We called them rubber burgers, but people actually liked them. Personal pizza before anyone heard of them. Hoagie that I think was called a Torpedo made from a 6" piece of french roll, cotto salami, bologna, and white american cheese. There were others such as Polish Sausage, a long bun with the same mystery meat burger, but topped with minced onion and a gravy like topping I believe called a Longhorn. These must have not been available in our region, I've only read about these. My favorite hangout as a teenager in the early 60's was a place called Johnny's Snooker in my hometown of Tulare, Ca. Several pinball machines, pool and snooker tables. The Stewart sandwiches were a real favorite! I definitely recall the hamburger and cheeseburger and pretty sure they had the torpedo. I actually thought they had a sandwich called the slim jim but I may have that confused with something else. I think that rings the bell as the name of the foot long hot dog with chili and onions. Seems to sound right. I remember a couple of bars that had one...I remember them as tasty, but that was always after several drinks. I remember them in the '60's as a kid. The bar my dad frequented had the machine, I was just amazed at the technology! I think they only had ham and cheese and a cheeseburger at the time. thank you for bringing back wonderful memories! Before my tiny town even had a mini mart, my parents would "go to town" (the next real city) to the 7-11 and bring me back a "Longhorn".. those were my faves! I wonder if there's anyone on this board that had any knowledge of the process? There were many imitators of the original and many regional processing plants operated by francisees. The method had merit for advance preparation that was clearly suprerior. Microwave products never achieved the same level no matter how much food science has been applied. The IR ovens cooked very fast and did many sandwiches in 3-5 minutes from a cold start. That's literally as fast as a microwave. Were the sandwiches flash frozen or just prepared, Doboy flow wrapped , sealed and refrigerated? What kind of cellophane was used in the wrapping process? It certainly wasn't airtight from what I remember. This must have been partially critical to the warming process as it simultaneously steamed the bread while cooking, but the residual steam also limited the heat temperature. Was there something about heating the product in the celophane that today would be cited as producing toxic components that would not been used today and the reason nobody has gone back to it ? I remember two types of IR light ovens besides the hot light/display used to hold already prepared sandwiches for on-demand sales. One with a drawer and the other had a hinge over cover much like a BBQ (most popular). Both only had a timer and could do about 6 sandwiches at a time. I don't believe they were capable of convection, but some models I see on the web do have ventilation ports. Any info anyone might know on the ovens? I believe the custom mnfr. of the ovens may have been Welbuilt. There's home appliances that can emulate this method and institutional products as well. Panasonic's toaster ovens work on this principle of using IR bulbs above and below to cook and reheat very quickly as others by Cuisinart and Breville. NuWave and clones are sort of doing sort of the same thing with only a top light. Stewart Sandwich started out in a Suburb of Minneapolis, Minnesota and grew from there. 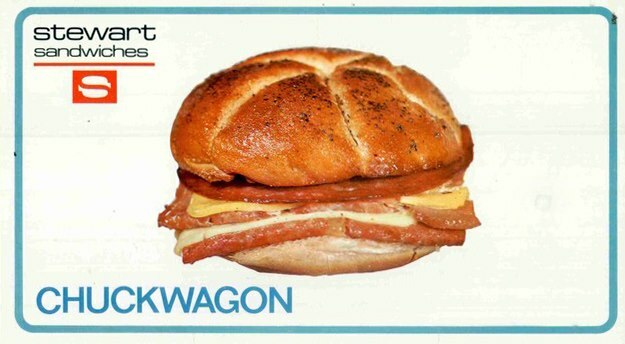 ﻿This was the top franchise for Stewart, The big seller was the "Chuckwagon". The distribution changed when Southland, A.K.A. 7-Eleven became a customer. I'm a picker, and I came across a Stewart Sandwiches clock. I've got it listed on Ebay and I thought I'd post the link on here as you seem to know about the sandwiches. It's not allowing me to actually post the link, so just go onto Ebay and search for Stewart Sandwiches Clock. You'll find it that way. I've enjoyed reading the thread on these sandwiches and how people remember them! A nice person left a comment/reply at my blog entry where I told the tale of the wonderful memories I have regarding the incredibly yummy Longhorn sandwich. Here is the link to the entry about the Stewart Longhorn sandwich that I enjoyed enough to remember it years after it apparently departed this planet... never to be sold again. Okay, the link has been edited out. "Beloved Heat-and-Eat Sandwich Lost to the Past"
A link to this message thread is on the blog entry to assist others searching for information about the incredibly delicious Longhorn sandwich or Stewart products in general. I remember seeing the Stewart product line but the only product I enjoyed and bought more than once was a foot long spicy Polish. I remember the slightly browned cellophane but mostly I remembered a bun like toast on the outside and a gummy paste inside next to the Polish. Being from Wisconsin, I'd squirt ketchup on it and sometimes the seller offered raw onions to adorn it. It was an odd combo and thanks for reminding of something I hadn't thought about in years. Now does anyone recall broasted pork ribs with a Red Magic sauce? There was one of Milwaukee's original Greek restaurants called Sehmer's, that offered the ribs to go with their broasted chicken. Crunchy on the outside and moist and juicy on the inside, I've often wondered why I never saw this anywhere else. Company is still alive and well in Norfolk Va. and they even have a Facebook page! 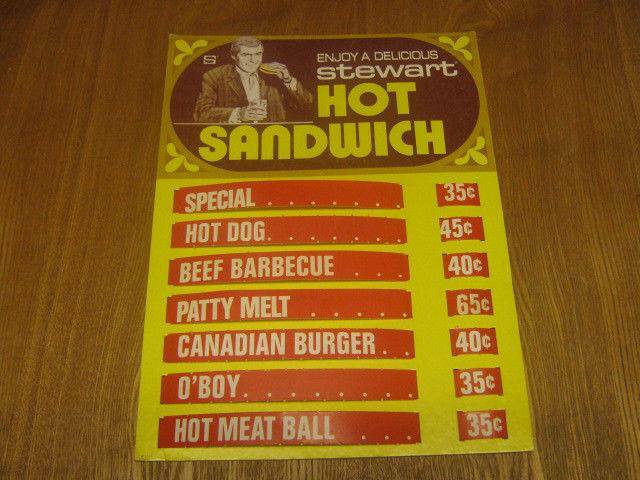 We used to sell the Stewart Sandwiches in our Arcade back in the 70's, We were provided the oven by Stewart. I remember the ham & cheese and double char-broil burgers being popular items as well as a small rectangular pizza. We're in western Kentucky and the Stewart route truck was based out of Evansville, Indiana. Miss those sandwiches. Far better than microwaved stuff IMHO. I remember seeing those sandwiches/signs in bars in south central WI as a kid.